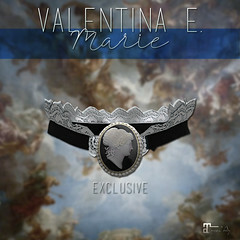 May 2014 – Valentina E.
NEW! 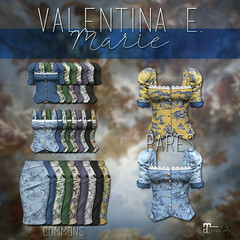 Valentina E. For June FaMESHed! NEW! Garden Party Dress AND our Persephone gown, out at the June round of FaMESHed! Our new Persephone gown is inspired by the season and features puffed sleeves, tiny button closures, a layered belt and comes in four colors. Our Garden Party Dress is perfect for all your spring and summer parties and festive occasions…. NEW! Valentina E. Coco Ruffled Gown @ The Boutique! Grab out new Valentina E. Coco Ruffled Gown only at The Boutique opening May 15th! Available in four colors, this stunning gown offers texture change options for the belt and bow and you can also turn the bow off altogether. This release is available in standard sizing only. Don’t miss it! Our new Harper Gown is out now at our main location in dramatic solids! Find it in standard sizes and Fitted Mesh. The belt is also texture change if you would like a bit of contrast. Don’t miss this dramatic design!